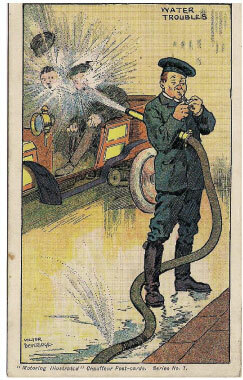 Victor Beveridge was one of the early postcard artists producing the artwork for at least two series of motoring cards. 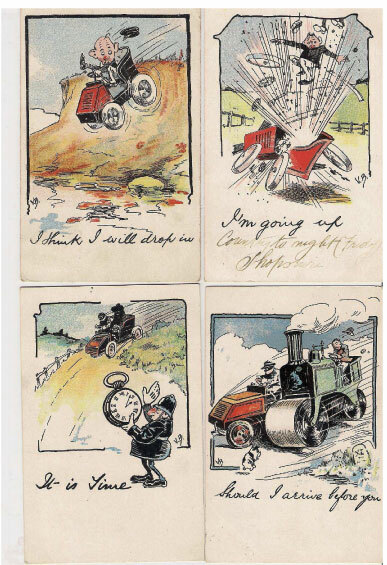 The cards illustrated are all about 1905: one set is very cartoonish (signed VB), but the others where he signs his full name seem better drawn (as regards motoring detail). He seems to have been involved in the commercial drawing world, as he was supplying artwork for 'The Advertising World' magazine (Ewart Seymour & Co) in 1904. This was described in an auction catalogue as "a strong evocation of the best of Edwardian advertising work". There is reference to a Victor Beveridge as a journalist for The Motor magazine who died in 1945. He wrote under the pen name of ‘Corporal Victor’. Whether the journalist and artist are the same person is not known. ----------------------------------------------------------------------------------------------------------------------------------------------------------------- The following information has been added by Jerry Lee-Browne who has been researching the entrepreneur, inventor and film maker Joseph Menchen. A Victor Beveridge was an associate of Menchen. They were together at the Wall Street bombing in 1920 where Beveridge was described as a 'former British Intelligence Officer'. Beveridge was a Corporal in the Army Service Corps and promoted to 2nd Lieutenant in June 1917. Robert Victor Beveridge had travelled to the USA on the Colombia ship from Glasgow in August 1919. His age on arrival was 40 years 8 months so this would put his birth 1878/1879. It would seem he worked as a motoring journalist and we have articles written by Lieutenant Victor Beveridge in 1920 doing a review of a La Fayette car. Also in 1923 by Captain Victor Beveridge of a visit to the Dodge factory in Detroit. Interestingly one of the famous photographs of Winston Churchill at the siege of Sidney Street in 1911 is credited to a Victor Beveridge - same person? This Victor Beveridge may or may not be the same person as the artist but it seems highly likely. Probably his career had moved from art into journalism. Grateful thanks to John Place for the supply of the images and information. Thanks also to Jerry Lee-Browne for further expansion.